Particular attention must be given to the design of the die and process parameters to prevent radial drawing stresses and tangential compressive stresses that can result in wrinkles in the material of the flange region of the part. This process work hardens the metal and creates a seamless finished part that is stronger than the original sheet metal blank. When the depth of the drawn part is greater than half its cross section, it is considered a deep draw. 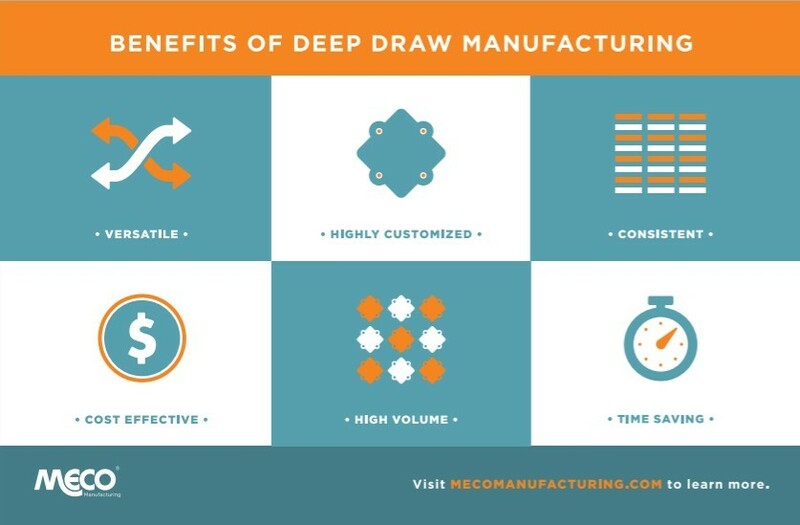 What are the Benefits of Deep Draw? Cost Effective – As unit count goes up, cost typically goes down. 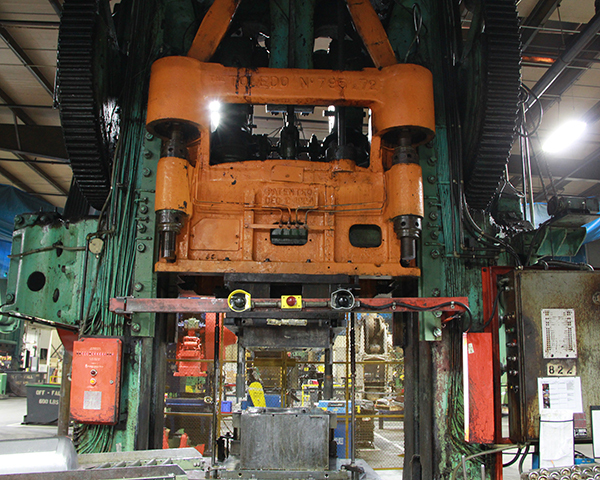 Since deep draw allows for production of high volumes, this provides a more cost effective solution. Additionally, in many situations deep draw requires drawing the part through many dies. However, in all the parts with a large cross sectional area made at Meco this process is achieved using one die which saves labor as well as tooling dollars. Less Waste – Additionally, deep draw produces far less material waste than most machined parts. Less waste means cost savings as well. What’s more, it can replace multi-part components creating a more nimble solution as well. Time Saving – Another benefit to deep draw is the efficiency created by its secondary operations being performed on the drawing machine. Furthermore, the deep draw process eliminates the need for secondary heat treating, which is another time saving benefit. Highly Customized – Deep draw is not one size fits all. For example, maybe you need a way to create a lightweight product that can withstand hard use. This method allows you to consider the function required of your end product and create something to meet that need. Versatile – Sometimes you need to fabricate products that have specific aspect ratios other manufacturing techniques can’t produce. Deep drawing processes often involve complex geometries that may be accompanied by the succession of other press forming techniques such as coining, curling, side piercing and trimming. Consistent – Finally, the part-to-part and batch-to-batch consistency deep draw affords offers peace of mind when you need to produce in large quantities. While a popular method used in the manufacturing industry, deep draw is still very complex and requires a great deal of expertise. The process of deep draw creates a stronger net shape at a lower cost due to reduced waste and can also lead to lower assembly costs. Deep draw can produce precise parts, is very repeatable, and may also be more cost effective than machining, die casting, or metal injection molding.